I dreamed last night about pre-race logistics for a half marathon I was about to run. The triviality of parking, porta-potties and pace groups isn’t particularly noteworthy. It’s the fact that, for the first time in years, I dreamed about running instead of skating. My brain never shuts down, even when I’m asleep. It just sets up the ol’ projector and starts the slideshow of what I’ve done and what I’m about to do. Before big events, Brainy becomes even more restless than usual – particularly if the events affect other people. Brainy will turn every dream into a dress rehearsal for the main event, which is just as exhausting as it sounds. I never enjoyed pre-bout jitters. I didn’t like getting physically sick nearly every time I anticipated a tournament or rankings-dependent bout. I can recall so many days of twisted guts and so many nights of fitful sleep….it left me susceptible to full-blown illness every time. Altitude sickness in Taos. Food poisoning in Tucson. My coach had to drive me back from San Antonio on a turn and burn where I’d thrown up so many times during the bout that I was too weak to sit up afterward. I used to brag about the barf bucket I had to keep near the bench (mostly because if you’re going to be that gross, you really need to fully own it). The nerves pushed me, but sometimes they pushed me down to the floor. Running has always been different – the nerves I feel before a race are like friendly little butterflies, fluttering just enough to make me want to move along with them. The nerves motivate me, not overwhelm me. They make me stronger, not weaker, because they sharpen my performance and give me that giddy tingle of anticipation every time I lace up my running shoes. It helps that most of my races are local. I’m more comfortable when I have my routines and I’m not driving for hours the day before. I think it runs deeper than that, though. For years, I felt so much pressure to not only win, but to win by as large a point spread as possible. WFTDA rankings are funny like that, or at least they were for the years I played interleague – sometimes it didn’t even matter that you won, because it still wasn’t enough. I took being part of a team very seriously, knowing how important my performance was to our overall success. Control freaks and perfectionists tend to view success as shared but failure as sole. By this, I mean we blame ourselves when our team loses or fails to advance in ranking. Even the realization that this is irrational – that no single skater wins or loses the bout for her or his team – isn’t enough to alleviate the self-imposed pressure that the highly competitive feel. Being in a leadership position compounds that stress – the captain is expected to not only play well, but to bring out the best in her skaters as well. Self-awareness is the first step to moving past roadblocks like this. I guess I never really moved past it, but it took a bit of distance to fully realize that. Running’s not always sunshine and roses. There’s barfing at the finish line and indignant ligaments and finishing slower than my goal time (which was already pretty slow). But it’s all mine, every bit of it, and it affects nobody but me. There’s a lot of satisfaction in that – in embracing personal expectations and owning personal disappointments while enjoying the social atmosphere of a race. I’m still sharing happy, active energy with others. Only now I’m not trying to slow them down, I’m actually hoping they’ll run faster so I’ll have somebody to chase. 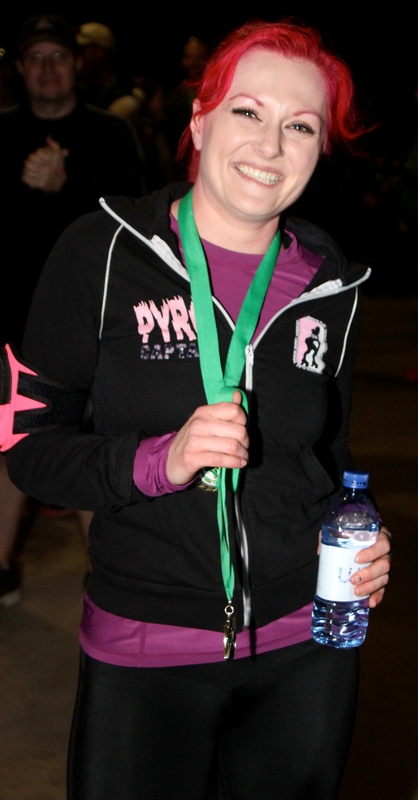 This entry was posted in Running and tagged competition, halfmarathon, pre-bout nerves, pressure, Roller derby, Running, travel team on August 9, 2013 by Pyro. I love every word you’ve written in this article – every single word! You could not have expressed your sentiments any better than you have here, and I totally agree with you.